Babywearing is the practice of carrying your baby in sling or carrier. It is an art that has been used all over the world for centuries. With the invention of the stroller we strayed away from wearing our babies but nowadays more parents see the benefits to just sling or carry the baby again. So why do we carry babies? Babies are meant to be worn, they thrive from the bodily contact and movement of their parents. The amazing world of baby carriers can be a little overwhelming since there are so many different options on the market. A new parent should keep in mind that babywearing can take a practice but we promise if you stick with it you will become a pro in no time. What are some of the benefits of baby wearing? Wearing your baby is so practical. You will be able to run errands, walk the dog, go shopping with your baby securely strapped onto you. For us New Yorkers it makes an awkward trip on public transportation into a walk in the park. Baby wearing promotes bonding. It is an easy way to connect and soothe your baby. It provides a womb outside the womb, an enclosed, warm protective environment that feels safe for your little one. It allows for hands free nursing on the go, and makes your life so much easier if you have to run after older siblings. Most importantly baby wearing promotes healthy mental, emotional and physical development. Babies who are worn spend more time in the “quiet alert state,” the ideal time for learning and observing the surroundings. Being close to a parent’s heartbeat, breathing, voice and warmth helps the newborn “get in rhythm” much faster. For extra super bonding, wear the carrier without shirt in your home to promote skin to skin contact. Babies who are worn cry less because mom or dad can read babies cues and needs as they occur. What are the types of carriers on the market? Generally you can put carriers in to 5 major type of categories. 1. 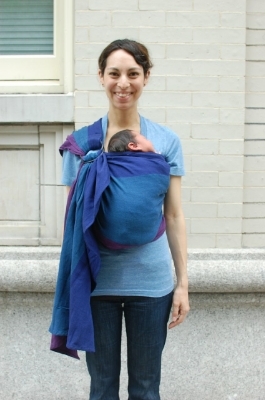 A ring sling is a one-shoulder carrier fastened with two aluminum rings. It is great for carrying newborns and breastfeeding, as well as being an excellent toddler hip carrier. Ring slings comes in all kinds of fabric from cotton, linen, silk and hemp blends. Ring slings prices can range from very inexpensive to expensive. 2. A Pouch is a one-shoulder carrier that usually is not adjustable on the go. They are great for hip carries for older babies, but not so much recommended for newborns. Pouches generally need to be sized to the wearer to guarantee a good fit. Pouches are worn over one shoulder. 3. A mei tai is a traditional Asian-style carrier which consists of four long straps around a rectangular body. Not only is this carrier simple to use, but it's also suitable for all sized babies and wearers. There are other types of Asian Style Carriers like the Podeagi or Onbuhimo with the Mei Tai style being more popular here in the USA. 4. A wrap is a long length of cloth that can be wrapped around your body. It can take a bit of practice to get the hang of it, but once you do, there are endless possibilities for comfortably wearing even the heaviest babies. Wraps can be divided into two styles: stretchy wraps and woven wraps. Stretchy wraps are inexpensive, but usually only work for the newborn stage and are used for front carries only, the exception being hybrid stretch wraps. Woven and gauze wraps can be used for front, hip and back carry. They are very popular in Europe and can be used for any stage. “Wrapping” does take some practice and dedication so it is not for everyone - which is okay. There are plenty of alternatives on the market. However if you take the time to learn to use the wrap it can be the most comfortable and versatile carrier you ever had. 5. Soft-structured carriers, or SSC for short, are two shouldered upright carriers with buckle closures. There are many types, so you are sure to find one that works for your body type. How to determine which carrier is right for you? 1. What is your body type? Are you petite, fluffy or very tall? Do you have an injury or a bad back? The best thing is to try on carriers in person. This could be in a store, local baby wearing group or at a baby wearing class. A lot of cities have special retailers or baby wearing educators that come to your home. 2. Are you planning to use the carrier only occasionally ? Do you want to bring your baby on hikes? Do you live in urban or suburban area? Do you want to breastfeed in the carrier? Do you own a car or do you take mostly public transportation? 3. Will you have a winter or summer baby? What climate do you live? Some carriers are just too hot in summer climates. 4, Do you want to share the carrier with another caretaker? If yes, you want to make sure the carrier fits both of your body types. You might want to avoid carriers that are sized or require a lot of adjustments. Your babies back and neck should be properly supported. Babies are born with C shaped spines, and carriers should support this natural position. Your babies hips should be supported correctly. Are the babies knees higher than hips? Your baby should be in a spread squat position in any carrier or sling. Is the fabric of the carrier spread securely? Baby wearing is safe but like with any other baby device there are few safety guidelines. Your baby should be in an upright position on your chest and worn high and tight. You should be able to kiss your babies head without straining your neck. If you need to bend to kiss your baby's head the carrier is either too loose, too big or worn incorrectly. Please avoid positions where your baby's chin collapses to the chest. Positional asphyxiation can be the result. Always keep your babies airway clear. Don’t cover up your babies head with blankets. Your baby should also be visible to you. Buy carriers and slings from a reputable retailer or manufacturer. There are a lot of fake or knock off carriers on the market that are not safety tested. Reposition your baby after breastfeeding. Remember there are tons of baby carriers and baby slings on the market. For maximum baby wearing success don’t just blindly add a carrier onto your registry without research. If you have the opportunity to try on carriers in person make that part of your to do list before your baby arrives. Find a local baby wearing educator, retail store or baby wearing group to guide you with carriers that might be appropriate for you. Practice with a weighted doll or bag of rice until your are confident. Make sure baby is well rested, fed, changed and content before putting him/her in a carrier for the first time. Talk to your baby while settling him/her in the carrier. Be sure that baby is snug to your body to ensure a comfortable and a safe carry. Don't be nervous. Babies can sense a lack of confidence. Parents around the world wear their babies, and so can you. Take the extra minute to be sure your carrier is properly adjusted. Spread the fabric flat to the ensure a comfortable and secure carry. Remember baby wearing takes practice. Be patient with yourself and your baby while you learn this new skill together. Babies love to feel movement. If you put your baby in a carrier and he/she is fussy get moving. Walk with purpose, maybe even go outside and walk up and down the block. Find experienced baby wearers or educators who can help you to troubleshoot that carrier. Don’t rush putting on the baby carrier or baby sling. If you don’t get it right the first time just start again. Be patient. I always compare it to learning how to tie your shoes. First it is difficult and then it clicks and you can do it in your sleep. Moby Go...come in and check them out.